or “peer reviewed article changed behaviour”, or “this one crazy trick will reduce your land use by 66%!”. I had known for a while that eating meat was resource intensive, and beef was particularly bad (mostly from MacKay’s Sustainable Energy Without the Hot Air), and over the last couple of years I have been trying to reduce my meat intake. Sometimes I claimed I was “mostly vegetarian” (with some success, a friend had known me for a few weeks before realising, as I chewed my bacon one lunchtime, that I wasn’t vegetarian). Recently a friend gave up beef, and as I said at the time it was probably a better environmental commitment than my “mostly vegetarian”. 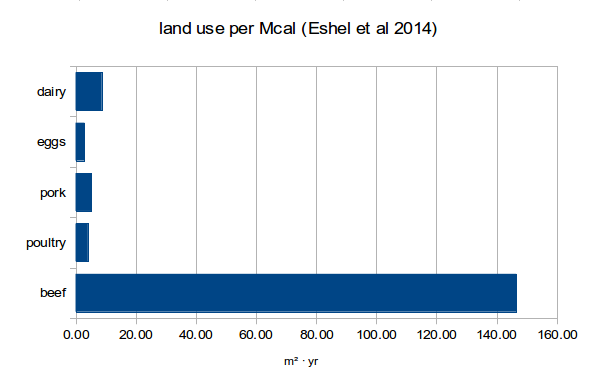 But it wasn’t until I saw the numbers crunched in Eshel et al 2014 that I decided to eliminate beef. It is no longer reasonable to entertain doubt as to the environmental impact of beef. In order to fit each graph into its tiny rectangle the long bars have been truncated and the extra long bit that has been removed has been replaced with a tiny number giving the coordinate that should have been plotted. For beef land use it’s 147 m²·yr (compared to poultry which is 4). So where the graph should show a spike that’s 40 times bigger, instead it shows one that’s 4 or 5 times. And this is their headline figure. The whole point of the article is to show how much more resource intensive beef is. Are the PNAS page charges really so high that they have to cram all the graphs into one corner? I’ve just shown the land use figure, but Eshel et al 2014 have analyses for water, greenhouse gasses, and reactive nitrogen. Tiny little arrows give numbers for potato, wheat, and rice (which are on the whole a lot smaller, except the rice’s use of water). You can explore the Supplementary Information too, including the spreadsheet they used. Obviously peer review is not perfect (it is merely evidence that a couple of reviewers ran out of reasons to delay its publication), and there are caveats. This studies only US beef. What about Europe? What about ostriches? What about food miles? But I think you would be foolish to think that these other matters would affect the central conclusion: eating beef uses a lot of resources.